Let me apologize up front for not writing about President Kennedy today. I figure others will pick up the slack. I need to write about a book. I’d love to sum it up in a pithy, “Two words for ya–” but unfortunately, this book has a MOUTHFUL of a title. Ready? 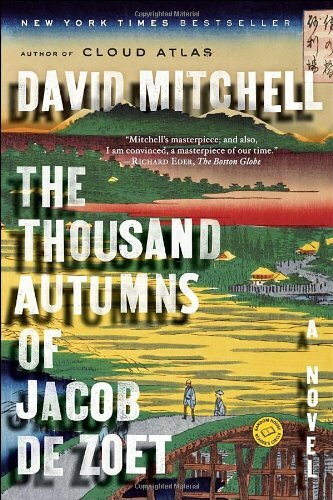 The Thousand Autumns of Jacob de Zoet, by David Mitchell. Normally my “can’t-put-it-down” books are mysteries–especially ones by Elizabeth George. But this literary novel has me in its clutches, and not for the usual reasons. Oh, it’s got the goods all right. Sympathetic hero with a blind spot? Check. Ridiculously authentic, obviously-well-researched setting (Japan circa 1800)? Check. Crackling dialogue (seamlessly “translated” from Dutch and Japanese yet!)? Sensory detail of the most intimate and unexpected kind? Aching love story? Political intrigue? Breathless plot twists? Evil villains? Check, check, check, check, check, and…check. But here’s what really gets me about this novel, grammar nerd that I am: its simple declarative sentences. Uzaemon glimpses the enormity of the risk he is taking. Would they bother with a warrant? Or just dispatch an assassin? Uzaemon looks away. To stop and think would be to abort the rescue. Feet splash in puddles. The brown river surges. Pines drip. Do you hear it yet? Feel it? Read the passage aloud. …where their flight began, over the balcony of the Room of the Last Chrysanthemum, where a puddle from last night’s rain is evaporating; a puddle in which Magistrate Shiroyama observes the blurred reflections of gulls wheeling through spokes of sunlight. This world, he thinks, contains just one masterpiece, and that is itself. I think I read that last sentence holding my breath, hearing the paragraph, like the gulls, wheel full circle back to where its flight began. I’m telling ya: this former English teacher and lifelong reader & writer gets chills. But I need to finish this book, and it’s your turn now. Do you have a book which you love as much for its use of sentence structure or language as for the story? Should I read it? Tell, tell. This entry was posted in Book Reviews, Wing's Words and tagged book reviews, Cloud Atlas, David Mitchell, Elizabeth George, Thousand Autumns of Jacob de Zoet by gretchenwing. Bookmark the permalink.